What can I use in place of maple syrup? I don’t like or use it ever. Hi Heidi, you are able to directly substitute honey for maple syrup, or you can use sugar (but add 1/3 cup to the recipe, and also add about 3 tbsp. to each wet ingredient for each cup of sugar). Hope this helps! 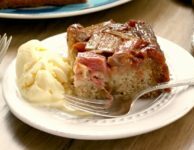 I tried the rhubarb upside down cake and it was wonderful. Hi Helen, so glad that you enjoyed the cake! Looks delish , don’t know if I fancy whisking the flour and baking powder together, I think I’d probably sift them to get them mixed properly. 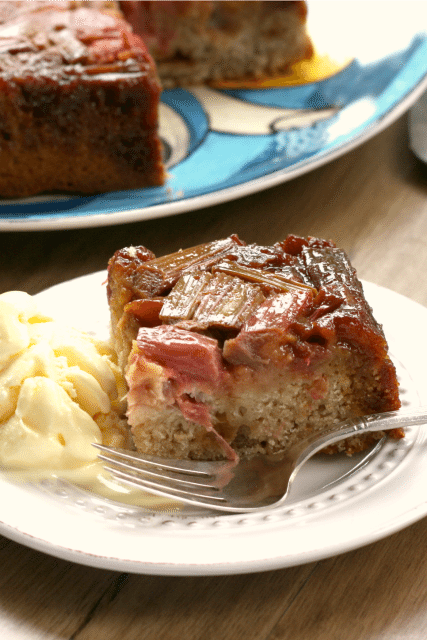 Would it make a big difference to use frozen rhubarb for the Rhubarb Upside-Down Cake? Any advice on altering the recipe for this? Thanks! 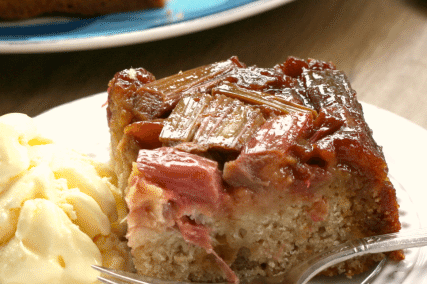 Hi Joanne, I have never tried the recipe with frozen rhubarb so am not sure if it would make it quite wet on top.If you give it a try please let me know how it works out. 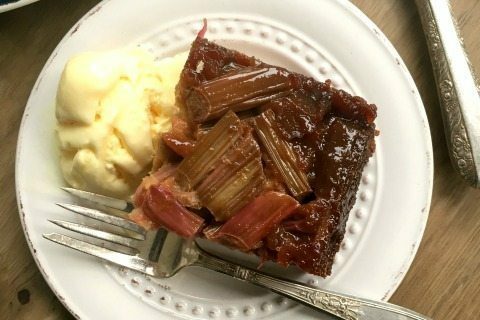 How much is 4 cups of Rhubarb in weight? Or how many stalks so i will know how much to purchase. Also, do I unpan the cake as soon as it is out of the oven or do I let it sit for a while? Hi Paul, I don’t know the weight but would estimate that each stalk would be about a cup. As for upending the cake, you can do it immediately or cool it in the pan for a few minutes first. I baked this cake for 45 minutes but when I inverted it, parts of the cake were underbaked. Hi Micheline, Were the under baked parts directly under the rhubarb? 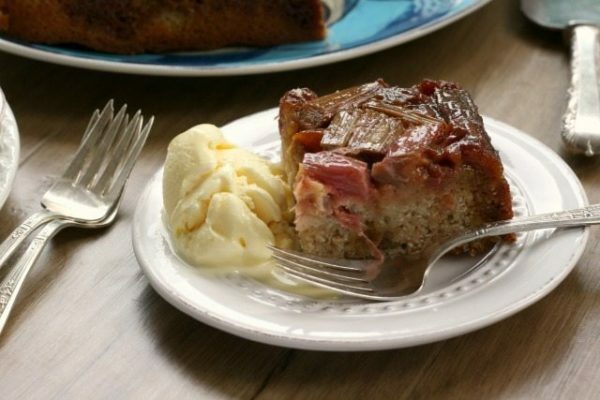 Sometimes it can be a little soft directly under the rhubarb but the texture should still be pleasant for eating. Also, did you use fresh rhubarb? It’s always helpful for me to understand when a recipe doesn’t work quite right for someone so I’d appreciate any extra feedback. Thanks.